The Eastern Transport Coalition, RACV and Monash University will each be stating their case for the critical need for improved public transport in Melbourne’s east during the Commuters Count Transport Summit held on Wednesday, April 9. It’s about time there was a concerted effort to see an integrated public transport network for Melbourne’s eastern suburbs if we want to see continued economic growth and social connection for local communities who continue to be overly car reliant. For too long we’ve been waiting for projects like Rowville Rail, critical to supporting Monash University as well as reducing road congestion. Paul Barton from Monash University will be speaking about their concerns at the summit, as will Brian Negus, RACV’s General Manager for Public Policy. 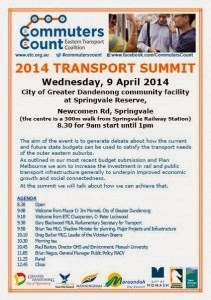 The Commuters Count Transport Summit is a unique event bringing together representatives from each of the major parties alongside other key stakeholders in the transport arena, and is a great opportunity to examine policies and promises prior to the state election. Don’t forget to like Commuters Count on facebook and use hashtag #commuterscount on Twitter. You can find the Eastern Suburbs Transport Poll results on the ETC website here, www.etc.org.au.